There were loads of runners I knew and who I was following from a distance on the day as we travelled down to London. But I thought I would highlight three, two of whom I run with regularly and one (Robert) who has helped me a lot with HR zones to run by among other things. Steven has written an excellent race report on his blog which is well worth reading. He didn’t run with Robert but they arrived within a couple of seconds of each other at Drymen. From that point their races went very differently. Robert continued to work his way through the field from 164th at Drymen to 56th at the finish whereas Steven went from 160th to 229th. This was Steven’s second ultra and I’m sure he will have learnt a lot. I have run and chatted with Jonny a lot over the past few years and I was very interested to see how his race would go. He was keen to run by HR and go for an even effort throughout the race. Robert had helped him with a HR zone to aim for. When I saw he took 2hr to Drymen I was really pleased and it didn’t surprise me to see him work his way through the field from 343rd at Drymen to 122nd at the finish. He ran a minute faster than last year but with a lot more fun as he overtook loads of people. He had a net gain of 221 people. It was probably more than that as a number of folks dropped out along the way and their splits are not included. So well done to everyone who ran on Saturday. There were lots of great performances with lots of pb’s. My next ultra, Cateran 55, is now less than 3 week away on Saturday 16th May so this week and next are key to making sure I arrive at the start line in the best condition I can. I plan to have an easy week the week before the race. I’m having a problem uploading my Suunto to my computer as the pins on the usb lead aren’t springing into position so I can’t post any maps or detailed stats! I’m sure you are gutted!! I’ve ordered a new cable so normal service will be resumed soon. I’ve had a couple of runs so far this week …. The weather wasn’t too good so I wore a jacket and gloves and it felt like winter again. I didn’t particularly plan to run it fast but I just went with the flow. I was feeling good and had a real spring to my step. When I looked at my watch after about 5miles I was expecting to see the average pace around 7:20mins per mile so was quite surprised to see it at 6:58. I pushed a bit harder over the last mile to make sure it stayed under 7mins per mile which it did. I ran the 6.23miles in 43:17 at 6:57 pace and felt really good. I didn’t have a warm up mile so I’ll be interested to see my mile splits when I can download the file. 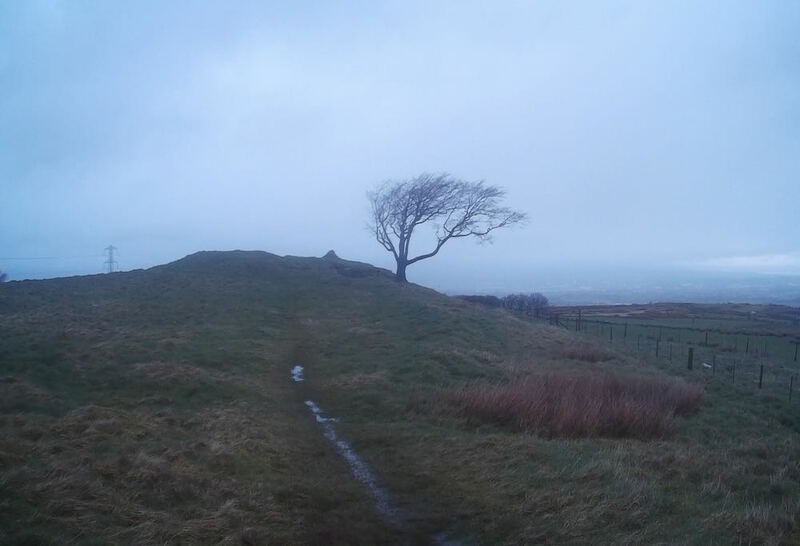 I decided to get up early and have a run on the Gleniffer Braes before work. So I was up and out the door just after 6.30am. Once again the weather was winter like. I wore my OMM jacket, gloves and buff and I’m glad I did. On the top it was really windy and pretty cold.. Part of the run I was right into the teeth of the wind so it made for good resistance training! These photos give a sense of the conditions …. I didn’t take any more photos as my hands were too cold! I ran the 11.6 miles in 1:47:48 and again felt good. Tomorrow night (Thursday) I’m doing my double Ben Lomond run. I’m looking forward to it and hope the weather is a bit better than the last two days. Hopefully my friend Cammie is joining me for the first trip. I’ll be opening my ‘Guess My Time’ competition for the Cateran 55 on Friday. Once again the good people at http://www.ultramarathonrunningstore.com have provided a great prize so watch out for that!! 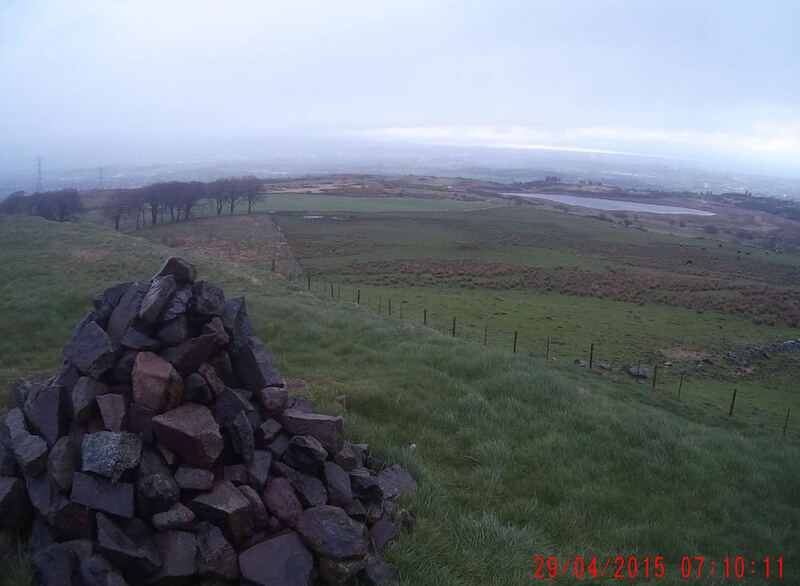 This entry was posted in Gleniffer Braes, Highland Fling Results, tempo run. Bookmark the permalink. I’m really curious about how Jonny felt his race went. Any chance you can get him to do another guest post? Clearly he paced it very evenly, with splits pretty close to mine from last year till the last section which I ran a bit stronger. Amazing to see that he was just a minute faster than last year. Was he racing this year, or taking it easier than last year? I have just begun my own Fling race report. The stats show that things went a bit astray on the last leg from Beinglas. I believe this was down to having raced a 31 mile ultra too hard two weeks before the Fling, my legs were never right from the start, but I carried on at pre planned intensity regardless, which looked to be bringing me home for a sub 9hr time, but then came progressively unstuck at the end of loch and ended up doing the last leg 5 minutes slower than last year. Two big lessons learnt – 1) don’t race two weeks or less before a big race, 2) adjust your ambitions w.r.t how your body feels earlier in the race. Steven went out too fast for his current level of fitness, I’m sure going out a bit more conservatively would have help the rest of the race. Dealing with the heat is common issue for us who train in the Scottish winter then race in the Spring and Summer so it’s not surprising that Steven struggled with it. It’s something we can train for by using hot baths and time in the sauna when you can get it, I’m sure this helped me during the second half of this years Fling. You only need a couple of weeks to adapt to heat so it’s something you can do during taper.